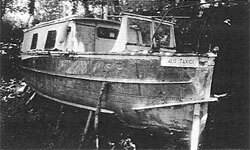 The KALO TAXIDI is a most unusual craft. This 23ft stainless steel launch was acquired as the KALO TAXIDI from her owner near Bradford-on-Avon in 1999. She had been in use as a canal boat and had a small cabin fitted on her aft end with an open area fwd fitted with a pulpit. 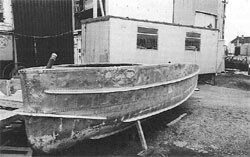 When found by the BMPT team, it was first thought she was an example of the aluminium built Airborne Lifeboats which were built by Saro post war, following on from the wooden versions that were built during WWII. However when a!] 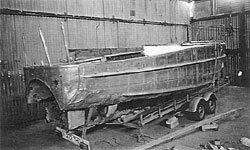 her canal boat fittings were removed and she was cleaned up, the tunnel stem feature with a 2¼ft dia propeller did not fit the design of the Aluminium Airborne Lifeboats. Furthermore some German writing was found on the craft which then indicated that she might be of German WWII origin. After a great deal of unsuccessful research by the team at BMPT, in early 2002, a reader of the Marchwood guide came up with the true origin of the craft. He remembered seeing two identical craft at a military museum at Ardagger in Austria. Of these two, one was built in mild steel, but the other was the same as the BMPT exhibit - built in stainless steel and not aluminium as was first thought. The boats of this type, the total number of which is not known, were built for the Army Engineers Corps of the Wehrmacht. They were of 7m overall length with a waterline breadth of 1.94 metres and were powered by a 4 cylinder Penta or Selve petrol engine of 80hp at 1,400rpm. The propeller mounted in a tunnel stern was a 4-bladed type of 0.76 metre diameter and 0.92metre pitch. The semi-circular objects on the bow are deflectors to prevent the boat flooding from its bow wave at high speed.